Dangerous railroad crossings are all too common in Iron County, Missouri, according to officials here. In December 2015, an Amtrak train slammed into a truck at a railroad crossing in Middlebrook MO and killed a local man. In that case, it appeared that the man may not have seen the oncoming train and he drove over the tracks into its path. That particular crossing has only a yield and railroad sign but no warning devices. Officials say that that fixing that particular crossing in Iron County is one of their top priorities. They say that they intend to install more flashing lights and gates at some of the more dangerous crossings in the county. They also intend to add lights and gates at another crossing in Annapolis MO that is especially hazardous for tractor trailers. Trucks tend to get stuck on those tracks and that could lead to another deadly incident. Our Virginia railroad crossing accident attorneys have seen far too many injuries and deaths in the past few years in these cases. In our experience, there is a tendency for the local police to just take the word of the railroad company’s investigator and blame the car or truck driver for the collision. However, there are many cases in our experience as railroad accident lawyers in Virginia where the railroad was negligent. For example, there are often maintenance issues at particular railroad crossings. In particular, we have seen many railroad crossing accidents where there was too much growth of vegetation around the tracks and this obscured the vision of the driver. It is the responsibility of the railroad to ensure that the railroad crossing is properly maintained, which includes vegetation being cut back that can reduce sight lines. Also, the railroad must ensure that the safety gates and lights are working properly. In railroad crossing cases where the railroad was negligent, settlements of hundreds of thousands or millions of dollars are possible. So, it is always worthwhile to speak to an experienced railroad accident lawyer if you have been involved in a railroad crossing accident. One person died in Jacksonville FL when an Amtrak train slammed into an SUV that was straddling the tracks last week, according to the Florida Highway Patrol. The police stated that the train hit the Chevrolet Tahoe at approximately 7:20 PM on Jan. 14. The driver of the SUV died after he was taken to a local hospital. According to witnesses, the driver apparently stopped on the tracks due to traffic. No passengers or anyone else was injured in the crash. Police continue to investigate the accident. Our research and experience as railroad accident attorneys in Virginia and North Carolina tells us that 31% of railway fatalities occur at railroad crossings. Despite what some people think, most train crossing crashes do not occur because the driver was trying to cross the tracks before the train got there. 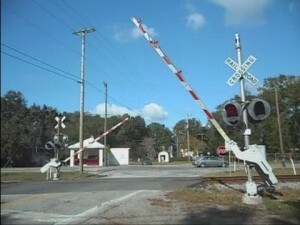 In fact, many railroad crossings are ‘passive’, meaning that they do not have gates or flashing lights. At many of those crossings, the driver is supposed to watch and listen for train. However, many of these railroad crossings have poor visibility. That was the case in one of our train crossing crash cases, where a Norfolk Southern train appeared suddenly and hit our client’s car, which caused serious injuries to his two children. A study was done of train crossing crashes, and sight obstruction was found to be a problem in 689 crashes, which led to 87 deaths. Active railroad crossings with flashing lights and gates also can be made to be safer. One problem with them is the warning time may be too long, which makes drivers impatient and they may drive around the gates. Sometimes the gates and flashing lights do not work properly, which opens the possibility of a personal injury or wrongful death lawsuit. A former switchman for Tacoma (WA) Rail has filed a lawsuit against the railroad. He contends that the railroad created a dangerous railroad work environment that contributed to the accident that caused him to lose a leg. Nathan Johnson, 45, from Fife WA, is seeking damages for his pain and suffering, lost wages and medical expenses. An earlier claim with the city showed that he is seeking $6 million. The lawsuit claims that he was trying to climb into a moving rail car when he fell partially under the train. The suit further states that Tacoma Rail actively encourages employees to climb onto and off moving trains to get work done faster and to reduce labor costs. Further, the claim states that the safety appliance on the railroad car were inadequate and in violation of the Federal Railway Safety Appliance Act. Our extensive experience in Virginia and North Carolina as railroad accident attorneys has shown that railroads often will try to avoid their liability for workers’ injuries on the job. We have represented many railroad workers who have been badly injured on the job, and have been pleased to reach large settlements and verdicts for our railroad worker clients. One of the most important things we want to stress is that railroad workers should not be afraid to take legal action against a railroad whose negligence may have led to your injury. In reality, there have been many successful personal injury lawsuits in recent years against railroads. Consult an expert railroad personal injury attorney in your state and the results can be highly favorable. A small town in Westchester County, NY may shut down the railroad crossing where an SUV driver and five train passengers died in a disastrous railroad crossing crash last year. The Feb. 3, 2015 train crash prompted the town of of Mount Pleasant NY to study whether vehicle traffic should be diverted from the hazardous railroad crossing at Commerce Street. The town supervisor noted that this type of major accident indicates that the crossing could simply be too hazardous to remain open. An actual closure of the crossing would require New York state approval. The deadly crash happened during rush hour during the week on Metro North’s Harlem line, which runs from Grand Central Station in New York City into Westchester County. It also continues on into nearby Putnam and Dutchess counties. The crash occurred when the SUV driver stopped on the railroad tracks after she had been diverted from the Taconic State Parkway after another accident. After the train smashed into the SUV, the third rail that powers the train pierced the floor of the first train car. Also, 12 pieces of rail tore through the car, which caught fire. More light has been shed on this crash this month, after the NTSB released many of its investigation documents about the likely cause of the crash. The NTSB documents revealed that the traffic control system at the railroad crossing that controls stoplights was out of compliance with federal guidelines when the crash happened. This is known as a preemption system, which is supposed to activate traffic lights as trains approach the crossing. The aim is to clear vehicle traffic from railroad tracks and to prevent accidents. The system was not properly configured to clear track traffic coming from Taconic State Parkway, according to Steve Ditmeyer, a former federal rail official. Ditmeyer now runs a consulting firm in Virginia, and he recently reviewed the NTSB report at The Wall Street Journal’s request. He noted that the proper stoplight sequence did not occur when the crash happened, but he was not certain if it played a major role in the crash. Since the crash, the preemption system at that crossing has been changed. Our Virginia and North Carolina personal injury lawyers have represented the families of many train crossing accident victims over the last decade. This experience has provided us with a detailed grasp of why serious injuries and wrongful deaths happen at rail crossings. If the families of the deceased in this tragic train/car crash want to collect compensation for their pain and suffering, it is important for them to work with the best railroad accident attorney they can. In Virginia, we often retain former railroad workers–who have retired–as investigators, or retain former federal railroad administration experts, and they conduct thorough investigations of railroad crossing crashes or railroad derailments. This work gives our team unique insights into the causes of these mostly preventable accidents. That type of skilled litigation is what helped us to win a recent $1 million settlement in a Virginia train accident. The head of the Federal Rail Administration (FRA) promised to be aggressive in urging railroad companies to install newly mandated safety systems as soon as possible, even though Congress moved the deadline back to 2018. The safety system is called Positive Train Control or PTC, and was supposed to be operating nationwide by the end of 2015. 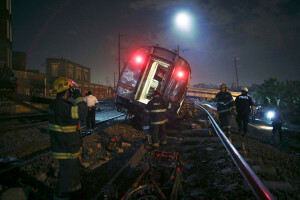 Its widespread use could prevent terrible derailments such as the Amtrak crash last May that killed eight people in Philadelphia. Railroads were behind schedule, so Congress decided to give them three more years to install PTC. The FRA head, Sarah Feinberg, urged this week that railroads should not delay until the last possible moment to install PTC. She urged them to make it their goal to be first across the goal line. She added that the public deserves the added safety features as soon as possible. The rail administration stated that it will have additional details on how it will approach the new PTC deadline in the coming weeks. Train derailments are often completely avoidable tragedies that could have been prevented if the railroad had done proper maintenance on equipment and had followed all federal rules and regulations. Our train accident legal firm worked on a derailment of an Amtrak train in 2000 in South Carolina where a street sweeper jumped a street curb and went up the CSX train tracks and damaged the tracks. An Amtrak train came along and hit the street sweeper, resulting in a derailment that injured passengers and employees. 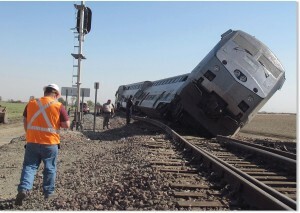 Our legal team went to work on this very complex derailment case. We studied the damage to the sweeper and we brought in an accident reconstruction engineer. We also did a land survey, took measurements and pictures of the accident scene and much more to build our case. Our theory was that a lack of a full ballast section allowed the sweeper to hit the cross ties and metal rail of the train tracks. Eventually, we proved that the track damage that led to the derailment would not have occurred if the ballast section had not failed to meet the specifications of CSX. This case went through two appeals, and eventually CSX and Amtrak paid to settle this very complex case. While the street sweeper did have some liability for the accident, poor safety and maintenance on the part of the railroad companies did contribute to the accident. The rail administration stated that it will have additional details on how it will approach the new PTC deadline in the coming weeks. The railroads collectively advised Congress that they would have to “shut down” unless the deadline for positive train control was extended. While we find it hard to believe that this doomsday scenario would have ever occurred, the railroads convinced lawmakers that there was no feasible way to implement the law by the end of this year. There are two sides to every story, but it seems like Congress and the federal Railroad administration should have required milestones or concrete steps that the railroads were required to meet by certain deadlines but it does not appear the new extension has required that. One thing is for sure: based on statistics alone there will be some avoidable railroad to derailments and collisions over the next several years that could have been prevented by the implementation of positive train brake control systems. Needless to say, we strongly support all railroads installing vital safety equipment to prevent derailments – as soon as possible.